The initial lineup has been revealed for the 2016 Rock’n Derby Festival. 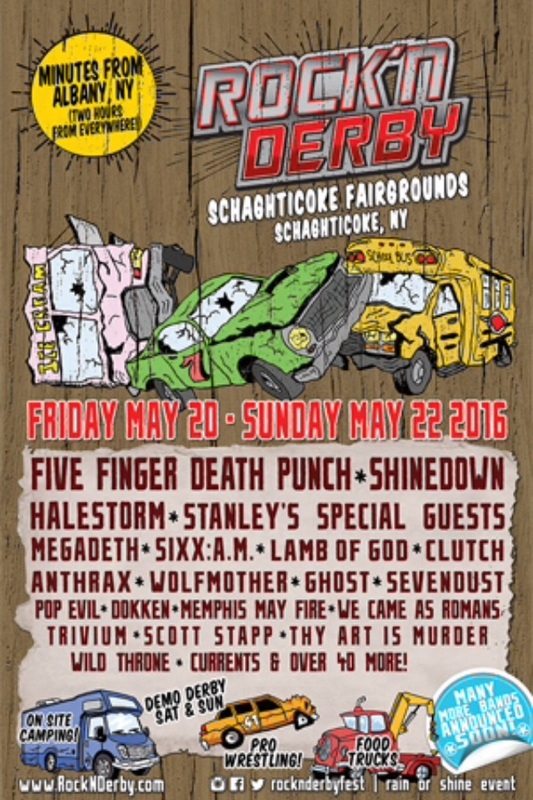 The event will take place on May 20-22 at the Schaghticoke Fairgrounds in Schaghticoke, NY, and will include: Five Finger Death Punch, Shinedown, Halestorm, Megadeth, Sixx:A.M., Lamb Of God, Clutch, Anthrax, Wolfmother, Ghost, Sevendust, Pop Evil, Dokken, Memphis May Fire, We Came As Romans, Trivium, Scott Stapp, Thy Art Is Murder, Wild Throne, and Currents. This event will also feature demolition derbies, wrestling, and much more.